We include a full guide to using the debenture template and which also explains the purpose of each clause and when to edit them with the template download. 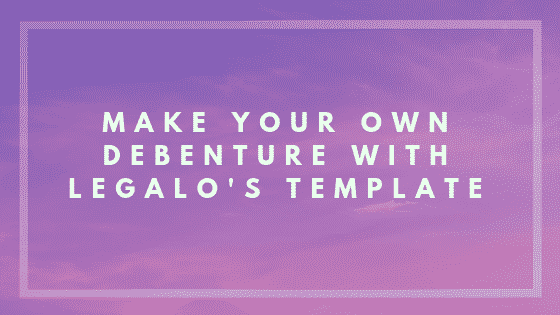 So you can get a better idea of what the template covers, the guide below walks you through each clause in the debenture template. Date – Insert just the year at this stage. Handwrite the rest of the date in the debenture template once all the parties have signed it. Party clauses – You will need to insert the names and addresses of party 1 (the borrower/debtor/company) and party 2 (the lender/creditor) and, if companies, the country of incorporation and company number. If the creditor is an individual, then replace the wording for it as applicable using the format: “[NAME] of [ADDRESS]”. This clause defines the main terms used in the debenture agreement template. In terms of the different classes of assets that are referred to as being charged, it does not matter if the company might not hold any of a particular type of asset yet – if it acquires some of it in the future, then it will be covered by this debenture template. Administrator – This refers to a person appointed by the creditor to act as an “administrator” if the creditor puts the company into administration as part of the enforcement of the security. Charged Property – This refers to all of the assets of the company, which are all charged by way of security under the debenture. Company’s Obligations – This refers to the money owed by the company to the creditor and may include any future debts while the debenture is still in place. If the debenture is discharged/removed due to the company having cleared its debts in full to the creditor, then, if security is needed again, a new debenture will be required. Debts – This refers to debts due to the company, e.g. from its customers. Encumbrance – This definition is self-explanatory. Expenses – Naturally if the creditor has to enforce its security, it will charge the company for all its expenses in so doing. Interest – Fill in the percentage interest that applies if any payments due under this debenture (such as expenses) are not paid on time. Receiver – This refers to a person that might be appointed by the creditor to act as a “receiver” or manager if the creditor is enforcing its security. Securities – This refers to classes of investment assets of the company charged under this debenture. This is the main clause in the document, under which the company grants a series of charges in favour of the creditor – see clause 2.1. In clause 2.1.1, fill in the address of any freehold or long leasehold properties currently owned by the company that it is charging by this debenture and the type of holding (freehold or leasehold). If it is undeveloped land (e.g. a field) or otherwise not simply known by its postal address, then fill in a description of it (in the case of registered land, this should match its description in the registered title). Where it is registered at the Land Registry, then fill in its title number. If it is not registered land, then delete the phrase in square brackets that refers to registration. for which a significant premium was paid to purchase the lease or its remaining term. Any other types of lease will not be good as security, as the lease will not have a sale value, but it is instead subject to the burden of paying significant rent each year. Although this debenture template refers to all types of lease as being charged, in practice you would not bother to fill in the addresses in clause 2.1.1 of, or register a legal charge against, leases that are not long leasehold assets, as they would not provide good security, as they have no real saleable value. After grant, the charges over property that the company currently owns need to be registered. For registered land, this means registering it at the Land Registry on form “CH1”. For unregistered land, this means registering a land charge at the Land Registry on form “K1”. See clause 3.4 regarding the registration of a “restriction” on the company’s granting any further charges over registered land. This restriction should be registered at the same time as the fixed charge on the property is. In the case of a company that is a UK company, you must also register the debenture at Companies House using form “MR01”. Deadlines and fees may apply for this. For example, in the case of registering at Companies House, you must do this validly within 21 days of the debenture’s date with a fee of £13, so be sure not to delay this or leave it to the last minute. You would need to make an expensive and wasteful court application to obtain permission to register the charge late at Companies House. So don’t miss this strict deadline. If the company acquires further freehold or long leasehold property in the future, then you should promptly register a new fixed charge against their titles at the Land Registry. You do not need to repeat the registration at Companies House at that point. This is because you would already have registered the debenture there when it was first created. Clause 2.3 explains the circumstances when a floating charge might automatically crystallise into a fixed charge. Clause 2.4 states when a floating charge can be converted into a fixed charge by the creditor. The creditor would give notice to the company of this. This clause sets out a series of requirements (dos and don’ts) so that the company looks after the charged property properly. For example, that it keeps the assets insured and in good repair, and does not to alter them significantly. This clause imposes restrictions on the company in dealing with the charged property. For example, it should not charge the charged property or rent it to to someone else without permission. This clause adds some standard management powers in the event that the creditor needs to enforce this security, e. g. due to the company not having paid the loan, etc back on time. After default by the company, the creditor will often enforce its security by appointing a “receiver”. The receiver has power to resolve matters, manage the assets and get them ready for sale. Clause 5.1 refers to the creditor’s power to appoint a receiver. Clause 5.3 sets out various standard powers the receiver will have. The receiver will pass his charges on to the company – see clause 5.1. Clause 6.1 sets out when the security becomes enforceable – i.e. after a default of some sort. Clauses 6.2 and 6.3 includes some extra protections and powers for the creditor and should not be deleted. As part of the security, the creditor will hold a “power of attorney” over the company. This will permit the creditor to sign documents or do various things on the company’s behalf. This might be needed, for example, if the creditor is enforcing the mortgage due to the company’s default. Usually, as a result, the company is not co-operating or responding to any communications from the creditor. This should reduce the creditor’s costs and reduce wasted time. Therefore the necessary charges for interest (for all of which the company is liable in any event) also reduce. Clause 8.1 makes it clear that if the creditor has from time to time other security for the company’s debts, the different forms of security do not cancel one another out. Interest is due on unpaid expenses of the creditor as noted above. This clause states that such interest will be compounded if the interest is not paid by the creditor regularly. Select from the options as to whether this should be monthly or quarterly. You then charge interest on interest.